Notes: Methoni Castle is a medieval fortification in the port town of Methoni, Messenia, in southwestern Greece. 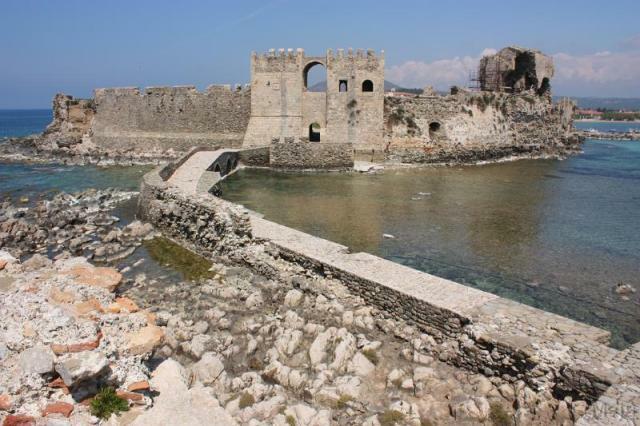 The castle of Methoni occupies the whole area of the cape and the southwestern coast to the small islet that has also been fortified with an octagonal tower and is protected by the sea on its three sides. Its north part, the one that looks to land, is covered by a heavily fortified acropolis. A deep moat separates the castle from the land and communication was achieved by a wooden bridge. The Venetians built on the ancient battlements and added on and repaired it during both periods that they occupied the castle.